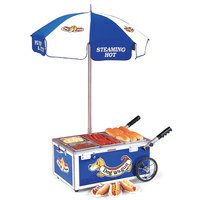 A hot dog rotisserie is the perfect piece of cooking equipment for your concession stand, snack shack, convenience store, or food kiosk. These cookers feature multiple rollers that continuously rotate to cook hot dogs. You can also switch between two temperatures to cook cold meats or to hold cooked dogs at warm temperatures until customers order. 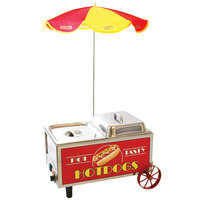 Our selection of hot dog cookers includes flat top options that are ideal for back-of-house applications, as well well as slanted styles that are more suited for front-of-house display because they give customers a better view of contents. We also carry larger enclosed merchandisers and hawkers that can broil meats. These styles can even help increase impulse sales thanks to their decorative panels. No matter what style you choose, you’ll appreciate that your hot dog rotisserie will fit on your countertop for easy access.